This is a lovely Summer Mediterranean dish, try with Couscous for a wonderful vegetarian alternative. Firstly prepare the peppers by cutting in half lengthways and removing the seeds. In a bowl prepare the breadcrumb mixture by adding the melted butter to the breadcrumb and herbs. Meanwhile, drizzle oil in a large heated pan and add the minced beef, chopped onion, tomato puree and beef stock and cook for 10 minutes until cooked through. Season well. Place the peppers in a baking tray and fill with the meat and vegetable mixture, top with the breadcrumbs and some grated cheese, and bake in a preheated oven 180°C/350°F/Gas Mark 4 for 20 – 30 mins until the pepper is softened. Toss the salad leaves in the oil, lemon juice and seasoning. 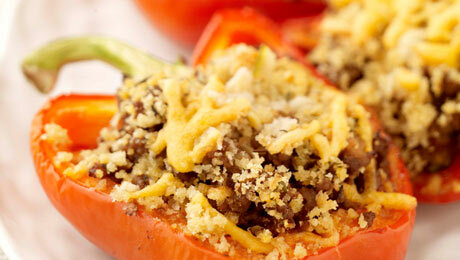 To serve, place the stuffed baked pepper on a plate with the dressed salad leaves. Freeze any leftovers and serve at a later date with some pasta.